If you are experiencing itchy, flaky, embarrassing and painful rash like symptoms you might be in the 1 to 3 percent of the world’s population with this disease. Psoriasis occurs with equal frequency in both sexes, but is seldom found in children under the age of five. Most frequently appearing in early childhood and adolescence, it reaches peak incidence during young adulthood. The cause of psoriasis is unknown, but it has been linked to genetics. Dermatologists theorize that a biochemical malfunction triggers the excessive skin cell production. People often experience their first attack or subsequent flare up if their skin is injured, such as being cut, scratched, rubbed, or severely sunburned. A flare-up will usually occur 10 to 14 days after the skin has been irritated. Psoriasis can also be triggered by some infections such as strep throat, AIDS, and by certain drugs including lithium, propranolol, other beta blockers, systemic corticosteroids, antimalarial drugs, systemic interferon and class one topical corticosteroids. People who live in cold weather climates usually have flare-ups in the winter when their skin dries out due to reduced humidity. Furthermore, they are unable to benefit from the moderate exposure to sunlight, which usually helps control psoriasis. 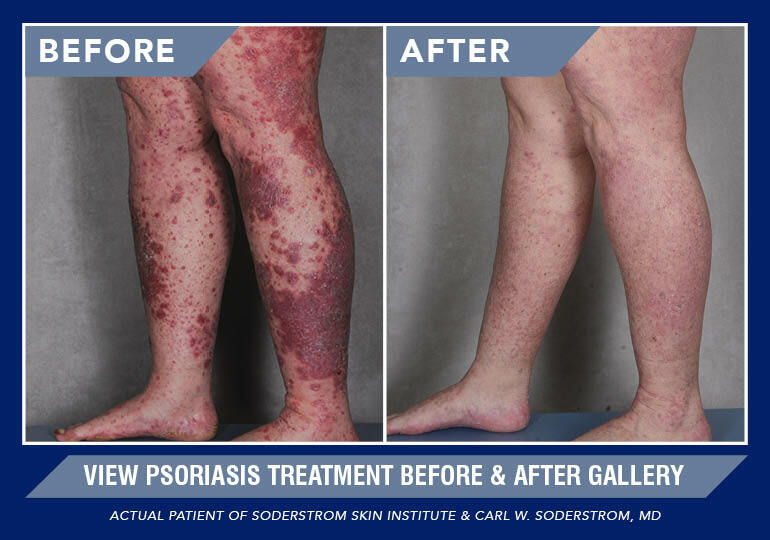 The Soderstrom Skin Institute Psoriasis Day Care Center is a specialized unit devoted to the care and treatment of those suffering from psoriasis, with special care and attention to the most severe cases. Upon initial examination, the physician will prescribe the treatment most effective for the patient. On return visits, a nurse specialist, who is highly trained in the field of psoriasis and dermatology, will follow the patient’s progress as the course of treatment continues. The physician will check on progress periodically, to determine if changes in treatment are necessary. Patients receive an individual treatment plan according to their needs. We feel it is very important for the patient to understand the disease, medications, and treatment options. In addition to providing the most current treatments available for psoriasis, the Day Care Center also provides an educational meeting and dinner each year, free to the public. Since psoriasis can have a significant effect on self-esteem, self-image, and even a person’s identity, these support group meetings are very popular. Because of the popularity and need for a support group, Soderstrom Skin Institute hosts monthly meetings, the third Monday of each month, to provide continued education and encouragement for people suffering from this chronic disease. For more information call Nicole at 309.674.7546. PUVA (phototherapy light treatment) has helped thousands of patients. However, some people suffer nausea from the psoralen pill that needs to be taken before PUVA treatments; others simply do not like taking oral medication. Some dislike having to protect their eyes and skin until the medication is out of their system. These problems can be avoided by adding psoralen to bath water. Soaking in the water for 30 minutes before exposure to UVA light is now an alternative to ingesting the psoralen pill. Unfortunately, this form of therapy is not available everywhere. Few dermatology practices are set up to provide baths for these severe cases of psoriasis. It is an option available only at psoriasis day care centers or treatment centers. At Soderstrom Skin Institute, there are two full-sized bathtubs available, in comfortable, private rooms. The advantages to this therapy include: immediate light treatment after the bath as opposed to waiting several hours for the oral medication to take effect, not having to wear sunglasses for 24 hours following ingestion of the medication, and not suffering the nausea or headaches that some patients develop*. Also, exposure time to the light is shorter since the medication is directly on the skin, therefore decreasing the accumulation of a lifetime UVA rays and chances of skin cancer later in life. All PUVA therapy is administered under direct supervision of a caring staff and dermatology nurse specialist experienced in phototherapy. PUVA hand and foot treatments are also available. Soderstrom Skin Institute is currently the only facility in central Illinois that has a Narrow Band UVB Light Machine. This treatment is effective in clearing many skin conditions such as psoriasis, itching, and atopic dermatitis without the use of oral medications. * Usually, after just two or three treatments, psoriatic plaques are less scaly and begin to flatten. * The Narrow Band UVB Hand and Foot Machine are also available at our facility for stubborn psoriasis and dermatitis on the hands and feet. Often, a combination of these treatments is required for the best results. Over a patient’s lifetime, psoriasis responds differently to different treatments. Unfortunately psoriasis can flare up again after any treatment and repeated therapy sessions may be necessary. The X-Trac Laser for psoriasis and vitiligo is available at Soderstrom Skin Institute; this is the first FDA approved laser treatment for psoriasis and vitiligo. The laser delivers UVB energy specifically to the lesion site via fiber optics. It is a cool laser so there is no pain or anesthesia needed. The X-Trac laser can deliver high exposure doses of light necessary for rapid clearing without the risk of damage to healthy skin. * Patients with mild to moderate psoriasis can often obtain relief in just four to ten brief treatment sessions. * Some insurance companies are covering this treatment for psoriasis as well as for vitiligo. There are medications available, given by shot or IV injections, which reduce the effects of the lymphocytic T-cells on different aspects of psoriasis plaque development. These agents are called biologicals, and have been approved by the FDA for inclusion in the treatment programs for psoriasis. Oral medications may also be used for stubborn or severe cases. Patients are followed closely for any side effects with these treatments. This is an oral medication that has a short half-life, meaning it is more rapidly excreted from the body and is not stored in the body fat. This enables it to be used as an alternative therapy for women of childbearing age. During therapy, alcohol should not be ingested and a pregnancy prevention program is advised for women. Patients are followed closely while taking Soriatane. This very unique treatment requiring no oral medication was introduced in 1925 at the Mayo Clinic, by Dr. Goeckerman. This safe and effective therapy involves a regimen of combining coal tar and UVB light. Coal tar is applied to the psoriatic patches of the skin and left on for two hours. * A UVB light treatment is then given, followed by a lubricating bath and application of creams. Administering this therapy in the Psoriasis Day Care Center, rather than at a hospital, saves patients thousands of dollars. Goeckerman Therapy is considered safe for both children and adults.